Reviled And Revered, TARP Expires For the past two years, critics of the $700 billion bailout have argued that it helped only Wall Street, not Main Street. But many of those who helped craft the program maintain that TARP ultimately cost very little and was absolutely necessary at the time. When the clock struck midnight, the Treasury Department's much-maligned Treasury Asset Relief Program, or TARP, expired Monday. The $700 billion program was engineered to stave off an economic collapse, as banks -- large and small -- across the country started buckling from the weight of the mortgage crisis. For the past two years, its detractors have referred to TARP as a four-letter word and argued that it helps only Wall Street, not Main Street. But many of those who helped craft the program -- from Congress to those within Treasury -- maintain that TARP ultimately cost very little and was absolutely necessary at the time. The Treasury Department first started laying the groundwork for TARP in September 2008 after the investment giant Lehman Brothers collapsed. Then-Treasury Secretary Henry Paulson collected a small but influential group from Congress and explained to them what would happen if banks crashed in the wake of Lehman. The economic forecast he shared was stormy. New Hampshire Sen. Judd Gregg, a Republican, was among the group. He tells NPR's Guy Raz that Paulson told the group they were on the "verge of a cataclysmic event." Soon afterward, party lines began to blur as the TARP legislation was debated. Some Democrats argued it would only help "fat cats" on Wall Street; some Republicans insisted the government had to step in. In a Rose Garden address, President George W. Bush urged the divided Congress to pass a bill that would allow for TARP's creation. "Government intervention is not only warranted, it is essential," he said. Gregg initially had a hard time believing what was unfolding before him. "It was inherently inconsistent with conservative thought that the government would step in to a situation like this," he says. "So I had to convince myself first." More than 700 banks would eventually receive federal money. They ranged from giants like Citibank and Bank of America to small banks and eventually credit unions. This is one of the few programs in the history of this country where the taxpayers made an investment, it did what it was supposed to do — which was stabilize the financial industry — and they got their money back with interest. TARP's $700 billion price tag was unpopular from the start. But at the close of the program two years later, it's estimated that TARP cost closer to $50 billion total. It's also possible that when the money comes back with interest, the government could make money. Knowing that, Gregg says he wonders why, even now, the program is so unpopular. "This is one of the few programs in the history of this country where the taxpayers made an investment, it did what it was supposed to do -- which was stabilize the financial industry -- and they got their money back with interest," he says. But there are still critics. John Cochrane, a professor of finance at the University of Chicago's Booth School of Business, believes TARP was a dangerous risk. "The biggest downside of it is [that] now we have the expectation that the government will always bail out all banks," he says. "That's something that's going to plague us for a while in the future -- though it didn't particularly make a big difference right then, in the heat of the crisis." Other economists, like Mark Zandi of Moody's Economy.com, disagree. While he didn't necessarily like TARP, he says it was necessary. On Oct. 3, 2008, President Bush signed into law the legislation that would lay the groundwork for TARP. Work had to start immediately, and Treasury Secretary Paulson needed someone to run the program. He called on Neel Kashkari. Kashkari had only been at the Treasury for two years. He had previously worked at Goldman Sachs when Paulson was CEO. The two didn't know each other well, but when Kashkari heard Paulson would be the next Treasury secretary, he gave him a call and got a job. When the economy collapsed, he was formulating the Treasury's bailout operations. Things kicked into high gear when Lehman Brothers failed. The biggest downside of it is [that] now we have the expectation that the government will always bail out all banks. That's something that's going to plague us for a while in the future — though it didn't particularly make a big difference right then in the heat of the crisis. "We had been working for months and months, trying to put out the fire, seven days a week, all hours of the day. And at that point [when Lehman Brothers failed], we realized that our worst fears were potentially coming true -- the potential for a global financial collapse that could literally plunge our country into a repeat of the Great Depression," he says. Anxiety was high at the Treasury over the next few days. "I just kept reminding myself that being scared or panicking is not going to help us," he says. "All we can do is try to do our very best, do our job, and pray and hope that we will be able to stabilize the financial system." Soon after Lehmann Brothers fell apart, he says, his team knew they had to go to Congress and ask for help. "We were terrified. I mean, I had a mortgage and I was terrified that if the money markets collapsed -- and they were showing real signs of stress -- I wouldn't be able to get my own money out to pay my own mortgage. I often thought about, maybe I should take money out of the money markets," he says. "But then I didn't do that because I thought it would have been unethical for me to do that because I had an information edge over the American people. If the financial system had collapsed, all Americans would suffer." Kashkari thinks one of the reasons TARP was so unpopular is because it went against an American cultural belief that a part of risk-taking is accepting the consequences when your attempts fail. "We had to turn that [belief] on its head to bail out the financial system. So this elicited deep, deep anger in people across the country, and that was reflected in members of Congress," he says. He became a sort of punching bag for legislators during his appearances at congressional hearings. "When I went to testify, I was now one of the faces of this program. I had to do my best to explain what we were doing and why we were doing it, but I also had to represent us and show that I understood the American people's anger, I understood how deeply unfair this crisis is," he says. "But we had to stabilize the financial system, because if we failed, it would be the American people who bear the consequences of that." Oftentimes, it meant he just had to sit there and absorb their verbal lashings. "It was an opportunity for members of Congress to vent the anger they were hearing from their constituents. And because I was a young man at 35 years old, I think they felt it was appropriate for them to take it out on me -- which is fine. I sat up there, I think, in total, for 25 hours of testimony -- most of which was exceedingly hostile." 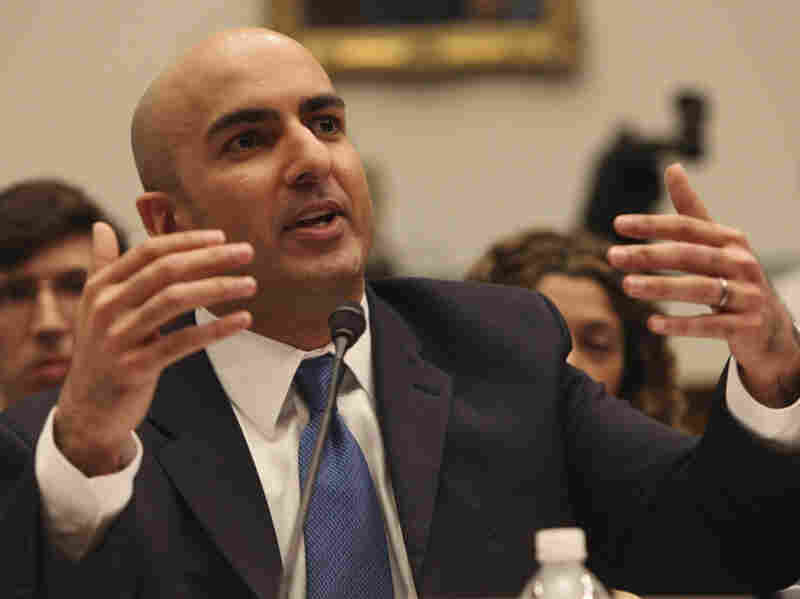 Throughout the testimony, Kashkari says, one particularly biting moment sticks in his memory. "I remember when Congressman [Elijah] Cummings from Maryland asked me if I was a chump," he says. "I remember just scratching my head, thinking to myself, 'Did he really just call me a chump? Or did I just imagine that?' "
But when the hearings were over, Kashkari says, their attitudes switched from critical to congenial in a matter of moments. "Oftentimes afterward, when the cameras were off, they would take you into a back room and tell you that they really appreciate how hard I was working or our team was working, that they support us and our programs, and let us know if they could be helpful," he says. "It was a 180-degree change from what they were showing in front of the camera. That obviously surprised me, but eventually I got used to it." Handling TARP operations was stressful for Kashkari, who describes spending days at a time in his office, hammering out details of the program with other Treasury employees. "We were working seven days a week, 18 to 20 hours a day, week after week, month after month -- no time for exercise, eating whatever fast food I could get my hands on," he says. He says the stress affected everyone around him. At one point, he says, a co-worker had a heart attack at work. "It took an enormous burden -- not just on me, but all of the many, many, many civil servants who just wanted to do whatever they could to serve their country," he says. By May 2009 -- seven months after he began running TARP -- he had resigned. "After three years in Washington, I needed to take about six or seven months off with my wife and live in the mountains of Northern California, and just what I call 'detox' [to] get Washington out of my system, get back in shape," he says. "It was just necessary therapy for me after what we all had gone through." After six months in the woods, he was ready to re-emerge. In December of that year, he started a new job as a managing director of new investments at PIMCO in Newport Beach, Calif.
As for whether he'll go back to Washington? He's undecided for now. "I am of two minds. On one hand, I am cynical of Washington and the politics and people more focused on maintaining their popularity or getting re-elected than doing the people's work," he says. "At the same time -- in the depth of the national crisis in September of 2008 -- I saw Washington at its finest. I saw and I was a part of Democrat and Republican leaders coming together to do something deeply unpopular but yet absolutely necessary for the sake of our country and for the sake of the American people. "I've seen Washington work, and I know that it can work, at least in times of crisis," he says. "I hope we can make it work in other times as well."